This Civil War Store Card (IL 95A) of Cairo, Illinois is ascribed to an unknown die sinker. Die IL95B is ascribed to W.K. Lanphear. 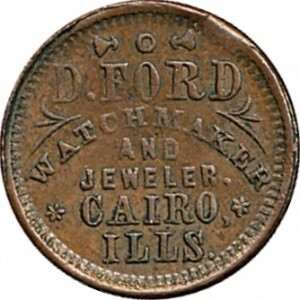 Lanphear was the second most prolific issuer of Civil War tokens in Cincinnati. His work is remarkable for the variety of motifs used as reverse dies on store cards. D. Ford / Watchmaker / And / Jeweler. / Cairo, / Ills.